When traveling on a golf tour, do you prefer a boutique resort over a larger branded property? Well here are lesser know Phuket resorts and some offering the best values in Phuket accommodations. My personal favorite is Mom Tri’s Villa Royale right on lovely Kata Noi Beach. 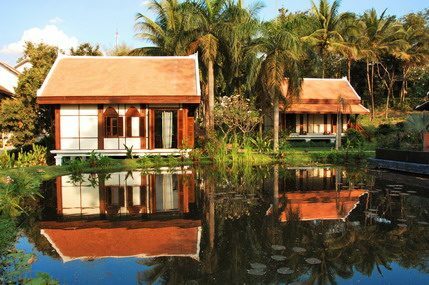 This resort has only 26 rooms, nine of which are individually designed in a traditional Thai style. With superb views over the bay, fine dining and probably the best wine cellar on the island. After your round at Blue Canyon Country Club, enjoy a fine bottle of wine at the hotel while watching the sunset over the Andaman Sea; what more could you want? Another small boutique style hotel, with just 21 rooms and suites, this time up in the hills over Patong, Baan Yin Dee, features a classic Thai design and a friendly atmosphere. After golf at either Phuket Country Club or Loch Palm, only 10 to 15 minutes away, you can relax and enjoy the four-tiered swimming pool or the twelve-person Jacuzzi; now that is a classy way to finish off a days golf in Phuket! A little larger is Access Resort, situated only five minutes away from beautiful Karon Beach. Each of the 80 rooms has direct pool access from the balcony and room service is even delivered by gondola! A more recent and very successful addition to the Phuket hotel scene is Twin Palms Resort on Surin Beach. Each of its spacious 79 rooms features innovative design. Even if you do not stay at the Resort, you should take in their Catch beach club, one of the best on the island. A further chic and recent addition to Phuket’s accommodation choices, Phuket Pavilions has 21 one-bedroom pool villas and nine three-bedroom villas, all with fabulous views of Bang Tao Beach. Phuket Pavilions is handily located for golf at Blue Canyon, Mission Hills and Laguna Golf Club. Are you on a limited budget? Don’t worry, you might consider the Deevana Hotel right in the heart of busy Patong yet set in twelve secluded acres of lush tropical gardens; or the 12 roomed Kata Minta, a stylish, classical Thai hotel with an unusual restaurant, ideally located in Kata; or the Peach Hill Resort occupying a superb site in a peaceful, verdant valley, yet only 5 minutes away from Kata Beach. Finally, for those who prefer a self-catering style holiday, Kamala Dreams, set on its own secluded beach, offers eighteen well-appointed studio apartments, equipped with air conditioning, kitchenette, microwave, mini-fridge, satellite TV and hot showers. One final point to note, since most of these properties are small in size, early bookings are mandatory as the resorts stay full through the year. Have a great trip and do let me know if you have any questions or personal favorite Phuket resort. I would love to hear from you. Why Bangkok Was Rated Best City In The World?